It’s back for the 3rd year - The Illawarra Festival of Wood! Over the coming months we’ll be updating this site with all the information you’ll need to know about this year’s festival. Including details on our very popular workshops, and how to secure your spot. This year’s event will also see the return of some of our key exhibitors, all willing to share their passion, knowledge and experience with you. And to ensure this is a fun filled family event, we’ve got a great line-up of entertainers planned, activities for all ages, and a vast array of food stalls to help make the 2019 Illawarra festival of wood a huge success. SO SAVE THIS DATE - We look forward to seeing you there … Suzanne & Stuart. Scroll down to view some of the action from last years festival. Buoyed by the huge success of last year’s inaugural event, the 2018 Illawarra Festival of Wood has been extended to a 3-day celebration, complete with an extensive programme of events, exhibitor displays, and interactive workshops that each member of the family can enjoy. Whether you’re a tradesperson, a wood enthusiast, an artisan, or just love the smell of timber, this year’s festival is bound to have something on offer that will interest and inspire you. You’ll find many of the exhibitors are masters in their respective fields and will be more than willing to share their expertise and knowledge with you. For the younger ones, there’s face painting, nature play and Parcour gym training, as well as a host of workshops specifically tailored for the young at heart – in fact, last year over 200 bush critters were made. And if all that action starts working up an appetite, there’ll be a range of gourmet foods available which you can enjoy whilst watching the chainsaw carving, indigenous wood carver, or the female wood choppers take on the men. Dr Mike Epworth is a renowned researcher and Australia's leading maker of the 'Jimmy Possum' chair. Mike will be conducting talks at this year’s Illawarra Festival of Wood on Friday 12th & Saturday 13th Oct to share his insights on this fascinating piece of Australian history - the man, the legend and the chair! CANBERRA: 09, 10 & 11 NOVEMBER 18. This inaugural event in 2017 was the brainchild of Stuart & Suzanne Montague from The Illawarra Woodwork School and Christian & Tomiko Timbs from Japanese Tools, who have a long association with the fine woodwork industry. Stuart & Christian decided to tap into the enormous interest in woodworking by organising a festival.The festival is returning woodworking back to its grassroots where people can enjoy hands on experience and learn about the tools, the skills and the craft of wood artisians. Part of the inspiration behind the festival is to rekindle the style of woodworking show from years gone by where it meant more than just an opportunity to sell finished products..
LUCAS MILLING TIMBER & Floristry FOR DEPRESSION & SUICIDE PREVENTION. Sydney & Southern Tree Services & Amber Louise Floristry will donate all proceeds from sales to depression and suicide prevention organisations. The Illawarra Woodwork School started in 2005 by Robert Chapman. Stuart Montague joined Illawarra Woodwork School in 2012. The initial projects are there to build knowledge and confidence in using hand tools. Japanese Tools sells high quality hand tools used for all types of crafts and skills. Centuries of experience behind these tools and the stories that tell them, reflects in the fine work done by craftsmen. Japan has a vast history of hand made tools across many disciplines. Since 1998, Vesper Tools is a small Australian business with a passion for making the highest quality and best value for money woodworking hand tools available in the world. Jim Davey is all about Sharp, Sharp Planes and Sharpening. Experience the joy of quality tools for sharpening and the results produced. Tips about Sharpening, Tuning and maintenance of sharpening equipment. Stay Sharp, Jim. Total Tools Fairy Meadow will be introducing the Woodfast range of woodworking machinery at the Festival plus demonstrations using SawStop table saw, KREG pocket hole joinery and router table, RIKON bandsaws, Festool domino joinery and Festool sanders, sharpening using RIKON low speed grinder and woodturning with Charlie. Allwood Speciality Timbers, Thirston Morris Fine Furniture is a connectivity of two businesses which brings together a number of elements, all of which are involved with the construction of furniture. It is a Timber Merchant which stocks and supplies a high standard of select grade timbers, both Australian and imported, it also provides the facilities to bring together Fine Furniture making, Woodwork teaching, Wood Machining and the provision of a Design Centre, including the rental of Bench Space. “My aim is to create a centre of Woodworking excellence, by supplying the best timber, being used by skilled crafts people to produce Fine Furniture and to impart some of these skills and knowledge to Woodwork enthusiasts. “ Thirston Morris. Native Australian garden design. Servicing Southern Sydney Thirroul Austinmer Coledale Bulli Kiama Wollongong Sutherland Shire Illawarra. Inspired by history & shaped for surfers, each board is a functional handcrafted collection piece using sustainable materials. Our craftspeople use traditional timber joinery practices to design and create a range of bespoke timber structures ranging from furniture to house frames and trusses. Hape Kiddle works from his studio in Yenda, andhas been creating since the age of six; crafting, building, constructing with anything he could hold in his grubby little fingers. Thinking back he remembers finding pumice stone in the Rangitikei and Hautapu Rivers in the Manawatu Region of New Zealand sculpting them to shapes and forms of all kinds. For a lifetime I have loved the medium of timber. As a child I was fascinated with building treehouses. I went onto become a high school woodwork teacher. I had the opportunity to build my own home and various furniture items. Today I package it all as ‘woodstories’. Styro Pyrography: Pyrographic art involves burning images or decoration on wood, leather and bone among other materials with a heated tool or poker. At Coasties Big Shed, we live by the motto: "Reduce, Reuse, Recycle, Repurpose. "We are the place to find items for renovations, repairs or even something to repurpose. SALT - Providing support to tradeswomen in Australia including apprentices and women seeking to work in the trades. Promoting women in the trades. As a locally owned and operated family business, we have a genuine passion for trees and the environment and pride ourselves on using the correct and safest methods for all our services. Dovetails For Diggers is marching forward with the intent to provide an essential service to adversely affected Veterans and Emergency Services personnel. Bob McRae is a professional artist with a career spanning over 30 years. 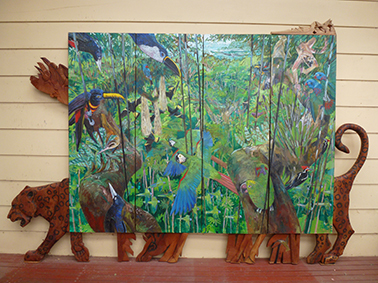 McRae works in a variety of mediums which includes adding bas relief Australian cedar carvings to single canvas paintings or to canvas screens. He also carves cedar in 3D form. Hanaya is based at the foot of the Foot of the Blue Mountains and creates bouquets of origami paper flowers from a variety of paper including Japanese origami paper, recycled books and music paper as well as selected scrapbooking stock. Workshops will be available all weekend. and give attendees the chance to see and learn how to make these paper flowers and take home a bouquet of that they made with their own hands. Mark Boxall & Mel Allen “Meraki Makers” have a passion for collaborative work, and have recently teamed up to create one of a kind pieces. They will have a selection of their current works for sale, along with a demonstration of knife cut marquetry by Melissa Allen running throughout the day, and Box assembly with Mark Boxall. Sarah's home and studio in Chinnock is nestled amongst the bush north of Tathra on the far south coast of New South Wales, Australia. Combining her silversmithing and woodworking skills Sarah creates contemporary jewellery for men and women to enjoy. Col Hosie is an accomplished box maker. Each day at the ILLAWARRA FESTIVAL OF WOOD, Col will demonstrate box making in our seminar area. Be inspired by our display of his beautiful boxes. Chat to Pam if you have questions about the jig. We always carry a full range of products to support your box making. Gifkins Dovetail makes the only Australian-made dovetail jig. It’s a beautifully designed tool that delivers precise joints every time. Use it on an under-table mounted router—no special fittings are needed. You provide dressed and sanded timber, two clamps, and you’re ready to start! Our aim is to provide our customers with quality, Australian-made products, backed by friendly service and professional advice. We also conduct box making courses in our workshop in Coffs Harbour. Welcome to Spoonsmith. Spoons, slowness, wilderness, roots & roaming, that's what we do. Our aim is to build an absolutely ginormous spooniverse where the simple act of sitting in the shade with a log in one hand and a knife in the other ends up with the crafting of more than just a beautiful and functional spoon. The Green Burials International team share a vision of a world where people can make their last physical act one of positivity and regeneration.We offer a range of outstanding and progressive burial and memorial products that help people mark the end of life in more personalised ways. Any standard router fits between two pieces of aluminium angle that are fixed to an aluminium box and the timber being machined is clamped in three self-centring vices. It is used in conjunction with a router to machine grooves. designed for amateur and professional use. Support us on Instagram hashtag your photos #IFOW and we showcase them in our gallery! Workshop day - bookings essential. Click the '2018 Workshops' tab for more information and to secure your place. Click the '2018 Workshops' tab for more information on all the workshops available and to secure your place. ,Sat 13th & Sun 14th October 2018 / 10am - 5pm . Food - An array of Food stalls & coffee will be available. ATM onsite at the festival. Please note there may be a long queue. FIRST AID - St Johns Ambulance available on site. DRIVE - Drive along the Grand Pacific Drive over the amazing Seacliff Bridge or through Wollongong on Memorial Drive. PARKING - Ample parking available on site. TOILETS - Well equipped with toilets. DISABLE ACCESS - Bulli Showground is a disable accessible venue. DOG FRIENDLY - Dogs are welcome if well behaved and on a leash at all times. Please contact us either directly or using our form if you are a wood artisan and would like to be a stallholder or would like any additional information.